Aluminium composite materials are exponentially growing up and rapidly gaining importance because of their properties like low density, high strength, high stiffness, environmental resistance, low co-efficient of thermal expansion etc. 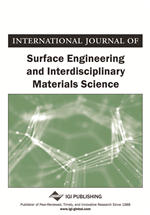 In this context aluminum-boron carbide composites, with 2.5, 5 and 7.5 wt% of boron carbide (B4C) particulate reinforced, were prepared by stir casting process and the effect of the percentage of reinforcement of B4C on dry sliding wear and friction coefficient were investigated. The wear tests were carried out on a pin-on-disc type apparatus at a linear speed of 1m/s, sliding distance of 500 m and a constant load of 30 N. The coefficient of friction was recorded on line. Wear rates were calculated from mass loss measurements. Scanning electron microscope was used to examine the tribo-surface of worn Al- B4C composites. The results showed that the wear rate of 7.5 wt% B4C composites is 0.375 mg/min which is significantly lower than pure Al alloy (3.125 mg/min). The friction coefficient decreases from 0.477(for pure Al alloy) to 0.261(for 7.5 wt% B4C composites). Metal matrix composites (MMCs) have considerable applications in aerospace, automotive and military industries due to their high mechanical properties and good physical behavior including light weight, electrical and thermal conductivity (Boey, 1998; Pravin, 2008). The commonly used metallic matrices are Al, Mg, Ti, Cu and their alloys. These metals/alloys are preferred matrix materials for the production of MMC. The reinforcements being used are particulates and fibers. (Miyajima, 2003). Aluminium is favored as matrix material in MMCs because of its low density, easy fabricability and good engineering properties (Khan, 2006). Aluminium matrix composites (AMCs) can be reinforced with various ceramic particulates such as SiC, Al2O3, B4C, TiC, AIN, BN, MgO etc. (Ipek, 2005; Kerti, 2005; Lee, 2001). The ceramic particulate reinforced composites find applications as cylinder blocks, pistons and piston insert rings, brake disks and calipers (Ceschini, 2001). While SiC and Al2O3 are common reinforcing materials in AMCs, limited research has been conducted on B4C reinforced AMCs due to the higher cost of B4C powders (Khan, 2006). B4C is an attractive reinforcement material because of its high strength, low density (2.52 g/cm3), extremely high hardness (Hv=30GPa), good chemical stability and neutron absorption capability (Mohanty, 2008; Toptan, 2010). There was a strength reduction and improvement in hardness in aluminium based boron carbide composites with increasing B4Creinforcement (Mohanty, 2008). Un-reinforced aluminium shows the lowest wear resistance when compared with composites, since they have highest hardness and second-phase volume content (Bermudez, 2001). The effect of cadmium addition on microstructure and wear behavior of the Al-12%Si alloy under dry sliding conditions was studied by Abbass et al. (2010). They observed that the addition of cadmium to Al-Si matrix decreases the wear rate and improves the wear properties for alloys containing Cd under loads above 10N. The wear behavior of AA6061 aluminium alloy reinforced with Al2O3, B4C, Ti3Al, and B2Ti was studied by Rosenberger et al. (2005) and observed that different type of reinforcement can generate mechanically mixed layers with similar wear resistance. Dry sliding wear characteristics of A356.2 aluminium alloy and A356.2/RHA (rice husk ash) composites was studied by Sivaprasad et al. (2012) and observed that A356.2/RHA composites exhibit higher hardness and resistance to wear as compared to un-reinforced Al alloy. Kumar et al. (2008) investigated the dry sliding wear behavior of AA7075 Al/SiCp composites and the effects of volume percentage of reinforcement, particle size of reinforcement, sliding speed, applied load and hardness of counter-part materials on wear rate was studied.